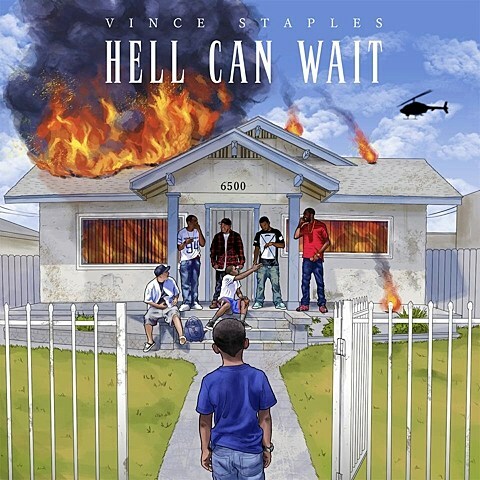 Vince Staples was initially supposed to release his Def Jam debut, the Hell Can Wait EP, back in September but it was pushed back and will now come out next week (10/7). Since we last spoke, Vince also revealed the artwork which you can see above. The EP will have production from No I.D., Infamous and Hagler, and despite previous associations with big names like Odd Future and Black Hippy, the only guests appearing will be Aston Matthews and Teyana Taylor. “I’m not for the features for the sake of features. I want it to really fit and align well with the project,” Vince told XXL. If you haven’t heard them yet, stream “Hands Up” and “Blue Suede” from the EP, below. Vince has been added as an opener to several dates on the previously announced Joey Bada$$ tour, including the NYC shows happening on November 8 & 11 at Irving Plaza. Joey’s fellow Pro Era members CJ Fly, Kirk Knight and Nyck Caution will be there too. Tickets for the Irving shows are still available.